The assertion below that the Kia Bongo was named after Omar Bongo appears to be wrong. As Ben pointed out in a comment below, Mazda began making Bongo vans in 1966 and Kia's Bongos are copies of them. I'd wondered why no mention of President Bongo's influence on the Kia Bongo's name appeared when I searched in contemporary newspapers. Now I know. Apologies for believing something that appeared in the Korea Times substantiated a rumor. Because who doesn't want to watch Kia Bongo ads from 1984? 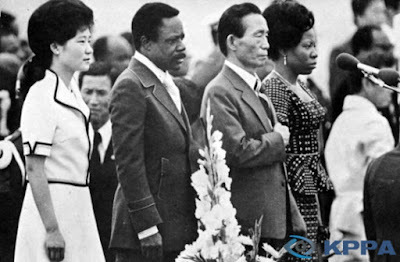 This visit was the fourth trip to Korea for the Gabonese president, who visited Korea in 1975, 1984 and 1996 as well. In celebration of his visit past years, the Korean government has issued postage stamps. 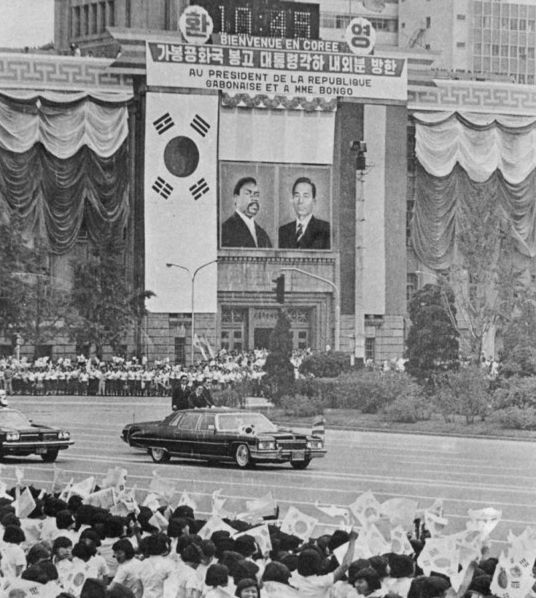 Furthermore, the popular "Bongo" vehicles _ vans and pickup trucks produced by Kia Motors _ were named after President Bongo at the time of his first trip to Seoul in 1975. [Edit: We now know this is incorrect.] To explain further, Omar Bongo ruled Gabon from the 1960s until his death in 2009, after which his son Ali-Ben Bongo Ondimba was elected president. The Kia vehicle - Gabonese president link is [incorrectly] mentioned in Korean here as well. Stamps issued to commemorate two of president Bongo's visits can be seen here, while photos of his state visit, such as the one below, can be found here. Another tie between Korea and Gabon is that the President's body guard was reported in 2010 to be Korean. Taekwondo instructor Park Sang-cheol answered an ad recruiting bodyguards for the Gabonese government in 1984 and "was assigned to guard Ali-Ben Bongo Ondimba, the current president and son of former president Omar Bongo. Since then, Park has been by the younger Bongo's side during his studies in France and throughout his career as ministers of foreign affairs and defense and other top-level posts in the government." As Park notes: "Gabon was the first among African countries to establish diplomatic ties with South Korea and it has continued to support our country on the global stage." Little remembered now is the competition between the two Koreas in the 1960s and 1970s for international recognition, in part for backing in the UN when the "Korean question" came up (as it did in 1975, when both Koreas got resolutions favoring passed at the UN - for the North Korean side of this competition, see Charles Armstrong's Tyranny of the Weak). But for now... make it funky! Whenever I hear about "a Bongo," I think of this one. Damn. So I guess that's an urban myth the Korea Times is just repeating? I did wonder why a search of old (Korean language) newspapers turned up no mention of it. Will update this post. I thought it may have been a clever way of saying we didn't copy it. Who knows. would love to know why the Japanese called it the Bongo. Maybe same guy? Apparently the Japanese bongo campers have big cult following in US and Australia.